The Parrish Art Museum provides a new way to experience art with a distinct sense of place. 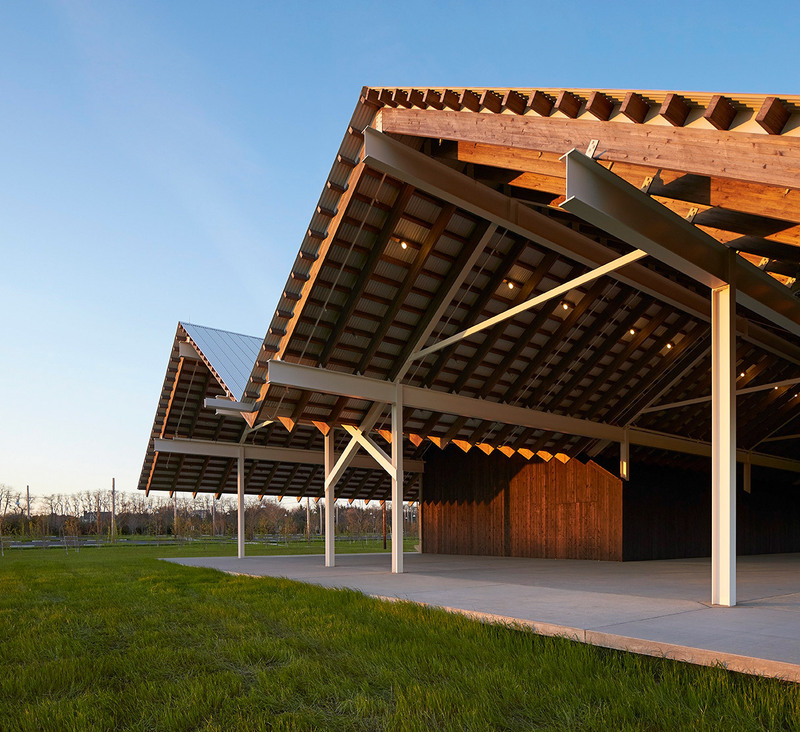 Sited on 14 acres of meadow, the Museum’s landscape and critically acclaimed Herzog & de Meuron-designed building honor the East End’s built and natural environment. Parrish Art Museum. Photo: Hufton Crow, 2013. 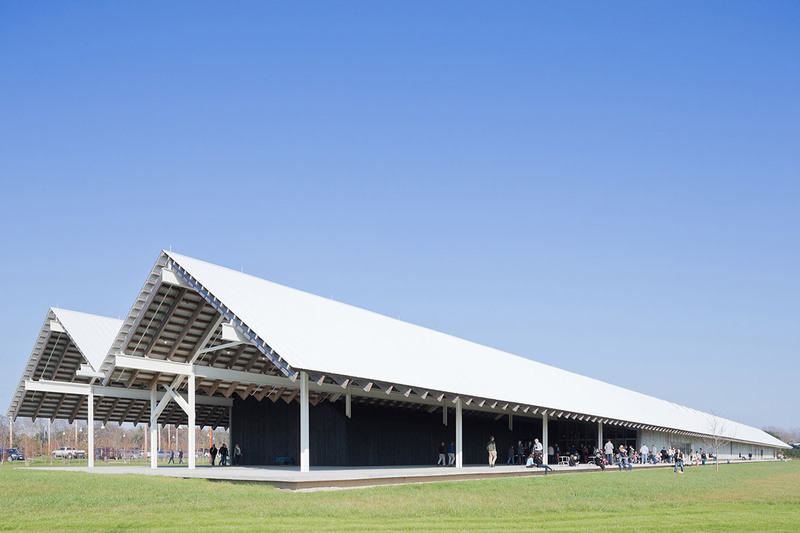 Designed by the internationally acclaimed firm Herzog & de Meuron, the Parrish Art Museum is sited on 14 acres in the hamlet of Water Mill. The innovative design integrates architecture and landscape in a plan that both respects and reflects the singular natural beauty and rich artistic legacy of Long Island’s East End. The building is inspired by the light, water, and sky that create the unique atmosphere of the region. The exterior suggests the vernacular architecture of sheds and potato barns that for generations doubled as artist work spaces. The sky-lit galleries recreate the light and proportions of the typical artist’s studio. The horizontal structure, sited to take advantage of natural north light, is nestled discreetly in the landscape. It consists of two parallel wings joined by a central spine that runs the full length of the building. The poured-in-place concrete walls are deeply recessed under a long, elegant white corrugated metal roof that extends over porches and a 6,000 square-foot terrace on the southwest end. Large sections of glass incorporated into the north and south walls afford floor-through views into the Museum and beyond to the surrounding landscape. 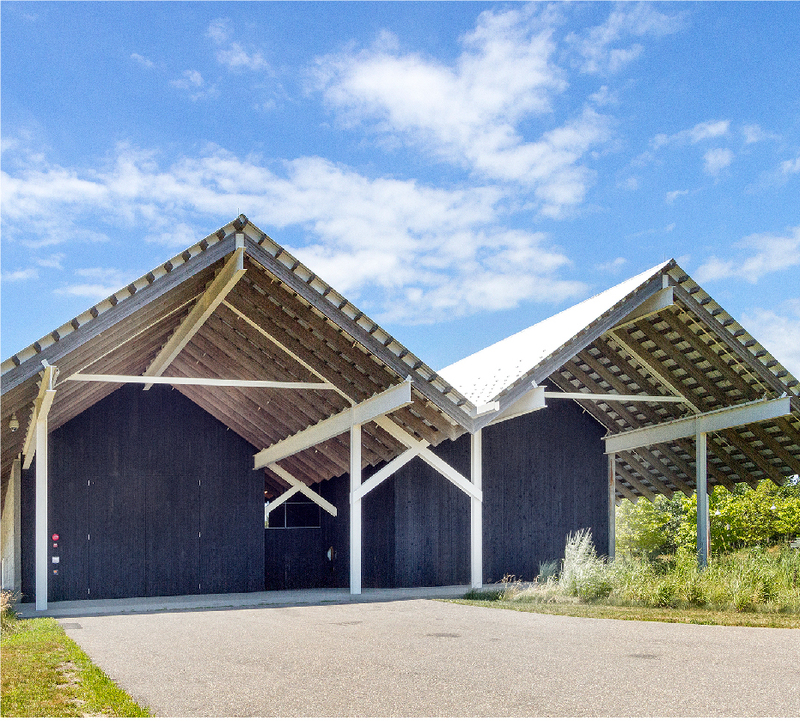 “The starting point for the new Parrish Art Museum is the artist’s studio on the East End of Long Island. 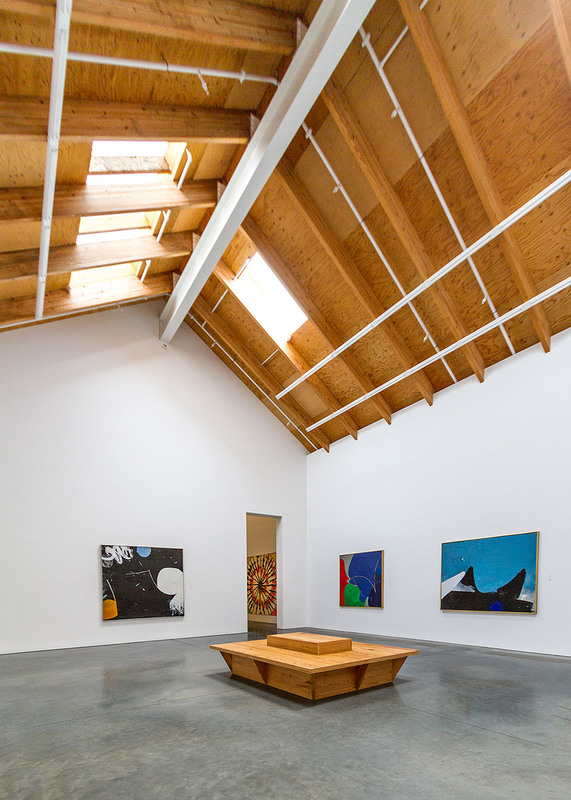 We set the basic parameters for a single gallery space by distilling the studio’s proportions and adopting its simple house section with north-facing skylights. An ordered sequence of post, beam and truss defines the unifying backbone of the building. Its materialisation is a direct expression of readily accessible building materials and local construction methods. 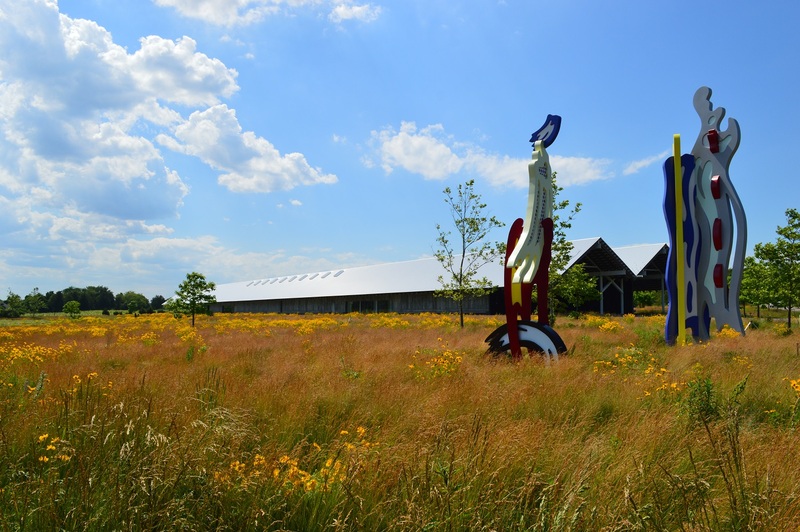 Visitors enter the Museum through the Wassong Family Gallery, a 1,000 square foot outdoor space with its wall of glass that allows a full view through the lobby gallery out to the southern meadow. Hand wire brush finish, black tinted stained double doors open into the Visitor Services area, Museum Shop, and Café. Developed by architects Herzog & de Meuron and industrial designer Konstantin Grcic, the interior mirrors the purity, simplicity, and functionality of the architecture. Natural wood—200-year-old heart pine salvaged from a demolished Virginia textile mill—ties the interior spaces together and establishes a human scale throughout the building. Air, light, and the relationship between art and nature have made the East End a compelling destination for generations of artists, and the intimate, well-proportioned Museum galleries embrace these qualities. The Parrish is one of the few American museums that presents work in natural light, creating a bright, open feeling in 10 sky-lit galleries. Traditional lighting is used in the two central “spine” galleries to protect the works on paper installed there. Based on a 1,000 square-foot module, the gallery spaces afford 12,200 square feet of exhibition space, allowing us to exhibit both work from our collection of more than 3,000 art works as well as temporary exhibitions. Art classes and workshops for adults, families, and children are offered year round in the Lynne and Richard Pasculano Studio. Just beyond the studio, through the glass double doors, is the 200-seat Lichtenstein Theater, where we present live music, dance, film, talks, and special events. Conceived as a single, integrated work, the architecture and landscape offer the public a unified and cohesive experience year-round. 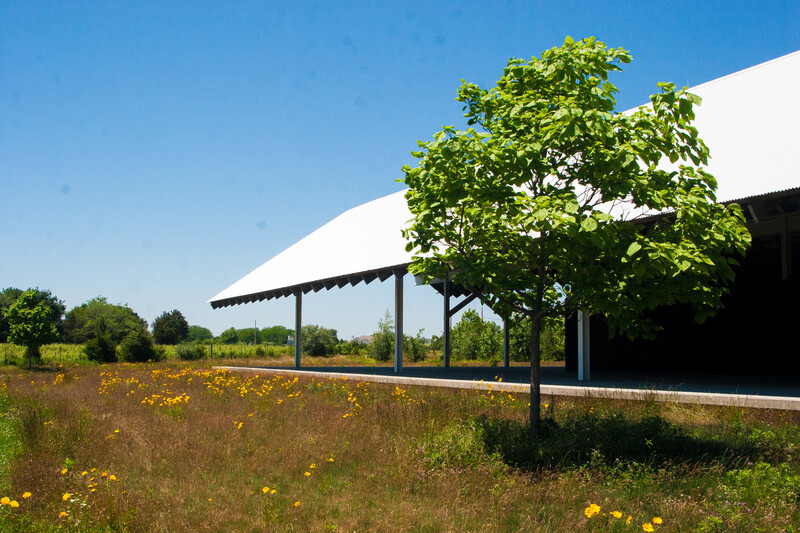 Like the building itself, the landscape evokes the agricultural heritage and iconic natural features of the East End. Designed by Reed Hilderbrand Associates, the site has been reshaped into expansive meadows that gently frame the building. Grasses and native wildflowers at the south of the site rise toward an oak and evergreen hedgerow at the northern boundary, where low trees delineate a maturing woodland canopy at the parking area. Planted Swales absorb storm water runoff as part of a site-wide land stewardship strategy. A flexible, 2,400 sq ft space with state-of-the-art audio-visual equipment and seating capacity of 200.